Good morning from Augusta. Gov. Janet Mills has had no problem getting her Cabinet assembled so far in a Democratic-led Legislature, but one nominee will face a loud test from conservatives and gun-rights supporters at his confirmation hearing today. That’s Michael Sauschuck, the former Portland police chief and the governor’s nominee to lead the Department of Public Safety. He is likely to be confirmed by the Maine Senate after a hearing before a legislative panel today, but it will be a difficult day for him in the hearing room. His confirmation would put an outspoken gun control advocate in charge of the Maine State Police. Sauschuck, a Marine veteran from Windham, was Portland’s police chief for six years and served two decades with the city’s department before retiring last year for an administrative job with the city. 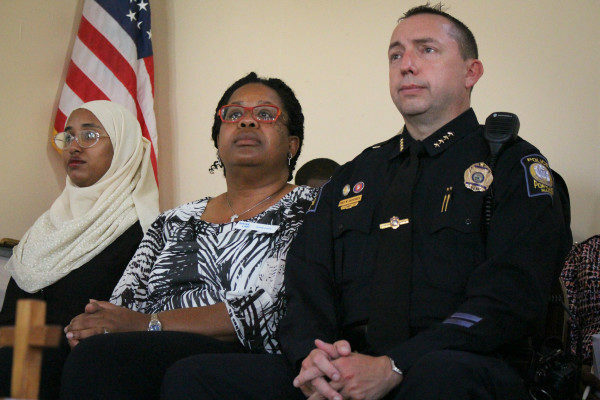 He largely embodied the progressive city that he served as an advocate for increased addiction treatment and hiring the first Muslim woman on the force. He was also outspoken on the issue of gun control, which is largely a non-starter in Maine politics — particularly in the rural areas that sank a 2016 referendum that would have expanded background checks to private gun sales. Maine has loosened other gun laws of late, including the 2015 move to nix a concealed-handgun permit requirement. Sauschuck was for that referendum, campaigning publicly for it in 2016 by saying it was “absolutely maddening” that guns could be transferred with no documentation. He also wanted to keep the permit requirement, saying it would make it easier for drug dealers to set up here. Many of those activists who opposed him on those issues are planning to be at his hearing today, including former state Sen. Eric Brakey, R-Auburn, a 2018 U.S. Senate candidate who led the legislative drive to repeal the permit requirement. His new group, the Free Maine Campaign, will lead a rally in the State House at 10 a.m.
Gun-rights activists will pack the room, but Sauschuck will likely be confirmed. After gun-rights advocates opposed his nomination in December, Mills defended her nominee’s qualifications. Democrats control the Legislature, so Sauschuck will likely breeze through. While Republicans haven’t fought Mills’ nominees so far, the deep-seated gun issues may lead to opposing votes from them today. Sauschuck’s hearing is likely to offer a stark contrast to those of three other nominees who breezed through committee confirmation hearings on Thursday. They were Pender Makin for the Department of Education, Jeanne Lambrew for the Department of Health and Human Services, and Anne Head for the Department of Professional and Financial Regulation. The Senate will have the final say on those nominations next week. Nine other Cabinet picks were installed in their positions easily by the Maine Senate on Thursday. The new governor’s first budget address is coming three days after her proposal is due to the Legislature. Mills announced Thursday she had accepted the invitation of House Speaker Sara Gideon, D-Freeport, and Senate President Troy Jackson, D-Allagash, to give her first budget address to a joint session of the Legislature on the evening of Feb. 11. More than any budget proposal since LePage’s first in 2011, Mills’ outline is being eagerly awaited in Augusta. She has pledged not to raise taxes, but she also wants to spend more on K-12 education, provide long-term funding for Medicaid expansion and prioritize property relief. This will be the first detailed policy plan that Mills will roll out to start her tenure. Maine’s junior senator said he was “disturbed” by what he characterized as the president’s cavalier dismissal of facts included in an annual report from the nation’s intelligence agencies presented the previous day. The report, compiled by experts in departments including the Central Intelligence Agency and the National Security Agency, included a summation of global threats that the country faces by, for example, Iran and the Islamic State. President Donald Trump shunted the report and leaders of those agencies as “wrong,” in a tweet. “If facts don’t matter,” said U.S. Sen. Angus King, I-Maine, on Thursday afternoon from the Senate floor, “it undermines the confidence that [we] have in the decision-making authority at the highest level.” More, he said, it conveys a message to national agencies who report to the president, “don’t tell the boss things [he or she] doesn’t want to hear. That’s disastrous,” King said. “If the president of the United States is not-too-subtly telling the intelligence community what he wants to hear, that will inevitably affect the quality of the product he receives … and the quality of the decisions he makes,” King said. — A Democrat quit her seat in the Maine House of Representatives.Four-term Rep. Jennifer DeChant of Bath announced Thursday that she would give up her seat today to take a job in the private sector. She is the second Democrat elected in November 2018 to give up a seat in this Legislature after Aaron Frey of Bangor refused to be sworn in so he could be elected attorney general by the new Legislature. Local party committees will be able to nominate new candidates to run for DeChant’s seat. Mills will call a special election to replace her, likely in the spring. — Permitting jurisdiction continues to factor heavily into debate about proposals to build large salmon farms in two coastal Maine communities. Nordic Aquafarms, the company that wants to build a land-based salmon farm in Belfast, recently asked the citizen Board of Environmental Protection to take jurisdiction over the project’s waste discharge application as state environmental regulators sought more information on the project’s potential impact on neighboring Northport. Opponents labeled the company’s bid to involve the Board of Environmental Protection —which opponents had previously requested — a diversionary tactic. Meanwhile, a Belfast woman dropped her challenge to a different proposed salmon farm in Bucksport. — A much-loved wayward hawk succumbed to frostbite at a Maine bird rehabilitation center. The great black hawk, which somehow managed to get to Maine from its normal flapping grounds in Central America, was euthanized Thursday after bird doctors determined that the hawk could not recover to live a normal life in the wild and that it was time to release the bird’s “spirit from its hopelessly damaged shell.” BDN banjournalist Troy R. Bennett memorialized the bird in song. In October, I mused briefly about the difference between long-suffering Red Sox fans like me — whose elemental relationship with the team was defined by heartache — and younger fans like Mike Shepherd, who grew up as the team established its dominance over weaker franchises like the New York Yankees by winning four World Series titles between 2004 and 2018. That difference is even more pronounced with the Patriots. People in their 20s and 30s have grown up with the Patriots reaching the Super Bowl about once every three years of their lives, on average. My formative years with the team were much different. They had a quarterback — Mike Taliaferro, pronounced “Tollifur” — who had been dumped by the Jets; a tiny ex-Canadian Football League kick returner who was arrested 20 times in his life and spent years behind bars after leaving the gridiron; and a linebacker who got up for games by taking LSD. The Patriots were nomads, moving from stadium to stadium, playing at Fenway Park and other venues where one would never think of playing professional football nowadays. The team changed its name from the Boston Patriots to the Bay State Patriots to the New England Patriots, mostly because Boston and the Bay State didn’t want to take all the blame. When the Sullivan family who owned the team finally found a way to build a stadium, they sold the naming rights to a brewery that makes really bad beer. After the toilets overflowed in a massive sewage tsunami to mark the first use of the stadium, the board of health threatened to shut the place down. Even after the emergency repairs, one could find putrid puddles and disgusting spontaneous leach fields at various locations throughout the dirt parking lots. My high school friends and I used to make the relatively short drive to Schaefer Stadium because tickets were cheap and you could always get them. Drunken tailgater shenanigans were usually more entertaining than the games. I once saw three inebriated guys from Rhode Island kick over a hibachi full of burning coals, then “fire walk” back and forth across the burning embers while waiting for the post-game traffic jam to ease. Conventional wisdom held that you could get drunk in the parking lot after the game, run out of libations and still have time to sober up before you would be able to escape through one of the all-too-few exits from the lot. And the team rarely won more than six games in any given season. I was married and older than Mike by the time the Patriots made their first Super Bowl, which they lost by 36 points.